UNANDERRA, Australia, March 28, 2018 /Christian Newswire/ -- For the sixth year in a row, Australia is calling the nations of the world to join with them to pray and fast for four days for the United States of America, from 30 April – 3 May 2018. 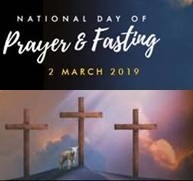 Commissioner James Condon, a member of the National Day of Prayer & Fasting team, said, "God has done remarkable things in America since we began to pray and fast, but God can do greater things yet! We in Australia believe it is our turn to stand in the gap for the nation of America and pray for revival and transformation for the USA through prayer and fasting according to 2 Chronicles 7:14. Whilst America has a new administration, the need for a new National Awakening has never been more apparent. "We in Australia are grateful for the protection that America gave Australia and the nations of the free world during World War II. The Battle of the Coral Sea, fought by USA in 1942, was the turning point in the Second World War for Australia. America continues to be a blessing to the world. Even to this day the USA is the largest contributor of foreign aid among all the countries of the world. Thank God for America! "President Reagan renewed the call for a National Day of Prayer in 1982 and said, 'National prayer is deeply rooted in our American heritage… The first National Day of Prayer was proclaimed in 1775 by the Second Continental Congress. As thousands gathered in prayer in places of worship and encampments throughout the new land, the dispersed colonists found a new spirit of UNITY and resolve in this remarkable expression of public faith.'" Sue Tinworth, a member of the National Day of Prayer and Fasting team, talking about the history of prayer in the USA said, "President Abraham Lincoln, on 30 April 1863 called for a Day of 'Humiliation, Prayer and Fasting' at a time of great national crisis by Governmental decree which said, 'We have grown in numbers, wealth and power, as no other nation has ever grown. But we have forgotten God… It behooves us then, to humble ourselves… to confess our national sins, and to pray for clemency and forgiveness.' Unfortunately, today America is again in a dangerous predicament because it has forgotten God. Sadly the situation in Australia is very similar. We in our nation have forgotten God and we are in danger of paying the price for our sin." Warwick Marsh, also from the National Day of Prayer and Fasting team said, "We are thankful for America's strong Christian heritage, but this will not save America, only the blood of Christ can. America and Australia need revival and reformation, as does the whole world. We all need more of God. We invite you and the nations of the world to join with us in four days of prayer and fasting for the USA."